I recently inherited an oblong la cloche, but I have no idea how to use it. Anyone have any special tips? They seem pretty fragile! Anything special about cleaning it up afterward? It seems that no one has responded to your question, so perhaps I can add my two-cents. I have been baking bread ( 2-3 times per week) for a little over a year, and use my clay bakers almost exclusively. They are not La Cloches specifically (although I do own one) but the same idea, I think. When I start my final proof, I place both the lid(s) and base(s) in the sink, full of water. About 30 minutes prior to my anticipated bake time, I dry the clay bakers (sort of), put the lid(s) on the base(s), and place in the cold oven, which I then turn on to pre-heat (usually at 450 - 475 degrees). When I am ready to bake, I carefully take out the baker(s), place on a rack, take the lid off, put my dough in the base, slash, place the lid back on, and place back in the oven. After about 30 minutes, I take the lid off, and continue to bake for an additional 5 - 10 minutes for extra browning. When the bake is complete, I just tip the bread out, and leave the baker top and bottom on a separate rack to cool. I do not wash the clay bakers (soaking loosens any baked on dough) nor do I grease or spray the bakers. Even with very wet doughs, I have seldom had a sticking problem. There are undoubtedly many contrary opinions on how to use La Cloche, or clay bakers, but I have had very good success with my method. Thanks Janice, I appreciate that. I oiled the bottom for my first try; but it was a particularly sticky dough. I appreciate your help! if you touch the dough once it is risen ready to bake it dies on you. well when the oven is up to temperature, your baker is dry? Dissolve the yeast and sugar in 1/4 cup of the water and let proof. Combine flour and salt in a large bowl, add the yeast mixture and the rest of the water. Mix thoroughly, adding more water or flour if necessary. Turn out on a floured board and knead for 10 -15 minutes until dough is soft, silky and elastic. Return to bowl, cover with plastic wrap and let rise in a warm, draft free place until doubled in bulk (approimately 45 minutes to one hour). Punch down dough, remove from bowl and knead a few times. Let rest for 5 minutes and form a ball. Sprinkle bottom of cloche dish with cornmeal and place the ball of dough in the center. Cover with cloche lid and let rise in a warm, draft free place until doubled in bulk (approximately 45 minutes to one hour). and place cloche, with lid in place, in oven for 15 minutes. Reduce heat to 400 degrees F.
last 5 or 10 minutes of baking. Coolon a wire rack and serve while still warm. (Thanks to Chuck Williams of Williams-Sonoma for use of this wonderful recipe). Well, in my case it was simply not not knowing any better. I let the dough raise in the bottom part as well - and I think that is how everyone else does it. My reading of carluke's post was that she let the dough raise in the pan as well, she was just smart enough to use the top to cover it. I used plastic, thinking that the top pan ought to be soaked until the last possible moment. But even though I did soak the top part, I cringed the whole time. I was sure that the clay was going to shatter. I placed something cold on a pizza stone a year or two ago and it made for a lot of little bitty pieces, all over the oven. I was pretty skittish! I think I know what you mean about the dough that "dies on you" - are you talking about how it collapses? I try to slash a good half hour before it gets that touchy. But then I look at my breads compared to yours and, well, maybe I am doing it wrong! 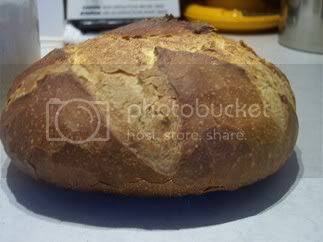 You post some beautiful bread. Sorry; I guess I wasn't very clear. My dough is risen in bannetons. The top and bottom of the clay baker is soaked, and then placed in the oven - with the top on the base - to preheat for about 30 minutes. Once preheated, I take the baker out of the oven, open it, tip the dough from the banneton, slash, replace the lid, place back in the oven, etc. In answer to Qatan's question; even though you would think that preheating the soaked clay baker would dry it out, when you take the lid off in order to place the dough inside, there is some obvious steam which escapes. The clay apparently holds onto some of the moisture inside of the closed container. ...and now you all know why I asked for help! My thanks to both of you.